Only 46 per cent of households reported the ability to save each month, while 42% were breaking even and 12% were overspending. Quite shocking! Isn't it? What about you? How are you coping? Where do you fall? Like always, would love to hear your thoughts and opinions! In my previous article, I wrote about how majority of the fund managers fail to beat the market but continue to charge high management fees which erodes the wealth of millions of average investor. In this article, my focus is to shed some light on why fund managers fail to outperform the market based on the evidence from years of academic research and the best course of action for an average individual investor. Why do stock (asset) prices move? This question has been the focus of academic research since 1860s. According to the academic research, at any given point of time, stock (asset) prices reflect all the available information. Prices of the equities react to new information, which is by nature random and therefore price movement are also random. This hypothesis is known as Efficient Market Hypothesis (EMH). This does not imply, that stock prices will not move up and down. When new information becomes available, market will react to it and the price of the stock will be accordingly adjusted (whether up or down) making it fairly valued. Based on EMH, we arrive at the conclusion that it's near impossible to buy undervalued shares or sell shares for inflated prices. This, in turn, implies that it is extremely difficult to outperform the market either through smart stock selection or market timings. A common question posed by opponents of EMH is how does one explain the dot com bubble of 2000 and its subsequent bust, housing bubble of 2005-2006 and then GFC in 2009. It is important to note that EMH is after all, a model, and like any model it is not perfect. The stock market is forward looking. In my humble opinion, the stock prices not just reflect all the available information but the interpretation and expectation (sentiment) based on the available information of all participants. Since stock market is forward looking, markets go up and down in anticipation of a recession or slower economic growth based on the interpretation and expectation (sentiment) derived from the new information. Most of the time, the expectation is more or less close to the reality . At times, when the unrealistic expectations gets the better of the investors it results in significant bubbles and bust. It is important to realise though, that, these are not an everyday event. Warren Buffet acknowledges that markets are efficient most of the time about most things and believes that there are exploitable “pockets of inefficiency” (Source: Tap dancing to work and Emory's Goizueta Business School and McCombs School of Business at UT Austin). Shrewd investors, who have the ability to not be swayed by the unrealistic expectation (both optimistic and pessimistic), can produce returns that outperform the market by a wide margin. Based on the quantitative evidence, such investors form a very tiny fraction (about 1%) of the investing community and odds of identifying such fund managers at the outset are extremely low. Within the last decade, the frequency of trading has increased by 100 fold from 20,000 trades per second a decade ago to 1.8 million trades a second. The number of investors have also increased in number. In the US alone, there are 14 times more mutual funds today, then there were in 1979. With every trade, investors give their estimate of how much a stocks is worth based on their interpretation and expectation (sentiment) of the available information. This implies that the price of every stock is the very latest, best estimate of the entire market. That's how efficient markets have become (if not totally efficient, very very efficient at least). Capital asset pricing model (CAPM) is a model to determine the prices of an capital asset in an Efficient Market. This depends on two things, the risk of holding the asset when markets fall and secondly, the expected returns. CAPM also introduced a concept called, market beta, a measure of the volitity of an asset or portfolio in comparision to the market as a whole. This allows assets to be categories by market risk, size, value, profitability and investments. In other words, the return you expect from a security is related to the risk of holding it when markets fall. By the same logic, small company stocks are more volatile (risky) when compared to larger stocks and if held for long period of time, should deliver higher returns. Another characteristic of financial markets is that the prices of different assets go up and down at different times. Hence, it pays for an investor to be diversified as it reduces the risk. Ideally, an investor should hold all the available securities in the market. What does all of this mean for the ordinary investor? Investing is counter-intuitive in the sense that when we look at the other products and services that we buy as consumers, higher prices usually equates to better product or service but not so in case of investing. Based on the evidence, we should be very wary of investors who say they can beat the market on consistent basis. Because markets are fundamentally efficient, consistent out performance is near impossible. The ordinary investor should therefore invest in passive funds that track the market performance at very low cost. I would like to sum up this article in the words of the best active investor of all times, Warren Buffet (who himself does not believe in EMH and says that if it was true he and Charlie Munger would not exist) endorses index investing, 'When the dumb investor realises how dumb he is and he buys index funds, he becomes smarter than the smartest investors'. More recently, Buffet gave these instructions to the trust, 'Put 10% of the cash in short term govt bonds and 90% in a very low-cost index funds. The long term results from this policy will be superior to those attained by most investors - whether pension funds, institutes or individuals - who employ high-fee managers'. If you look in the mirror and see Warren Buffet or Charlie Munger or Peter Lynch, go ahead and pick individual stocks, for the rest of us, sticking to a cost low-cost diversified index fund (or ETFs) will generate very satisfying returns over long period of time! Like always would love to hear stories from my readers. We all love to find a good deal. We go at great length to save a few cents/dollars on various items and services. We religiously participate in several rewards program, subscribe to 'Groupon', visit 'Catch of the day', collect vouchers to save a few cents on grocery items, drive several kilometers to save a few cents on petrol prices and spend weekends trying to find the best price on airline tickets, hotel booking among other things. And, we grumble every time government marginally increases direct/indirect taxes like $7 GP co-payment (now $20 GP fees). Yet, when it comes to our retirement savings (Superannuation), we don't seem to care. Majority of us have no idea about our superannuation balance, where its invested or the associated costs. Based on the internal data from Australian Taxation Office, as of 31st Dec 2013, the total lost super figure in Australia sits at a staggering $18.1 billion. Westpac's 2013 report on superannuation estimates the average amount of lost super per person in Australia is $2,592. (This modest amount compounded over 40 years at 11% annual return comes to an amazing $168,482.) We all seem to realise that we are living longer (average life expectancy is 85 years) and will require retirement savings to support us for 25 years on more. Despite all this, why is it that we don't seem to care about the all important retirement savings (Superannuation)? Firstly, because retirement seems far away, it feels absurd to be fretting about something that will not needed for another 30 or possibly 40 years while we have more urgent things to attend to NOW!. Secondly, most of us lack the expertise to invest in stock markets and believe it is best left to the experts - the fund managers. Fund managers are the so-called experts at investing. Using their expert knowledge, they invest money on our behalf in return for a fees. They decide which stocks to buy, when to buy and when to sell. Without a doubt, the fund managers are very well remunerated. But, here's the catch, evidence from various academic studies conducted across the world conclude that only 1% (very tiny fraction) of the fund managers were able to outperform the market on a consistent basis. Take the bonuses, fees and operating cost into consideration, it leaves nothing for the entrusting investor. In other words, 99% of the fund managers fail to beat the market, but continue to charge (excessive) high fees. Fund management companies charge around 1.6% on an average for asset under management. Let us consider the impact of high management fees, in a highly unlikely, but optimistic scenario that a fund manager manages to match the market returns. Due to the nature of how compounding works, high fees charged by fund management companies, end up making a very significant difference in total returns achieved by the investor. It would be perfectly reasonable to accept higher costs and charges if the fund managers were adding value over and above the market returns but evidence suggest otherwise. For a majority of investors,it is not worth paying a huge sums to money to fund managers to actively manage their investments. When it comes to investing - less is more. The less we pay in fees, the more we get to keep. As mentioned before, evidence from the reports and studies, do conclude that a tiny number of star performers exist, but it is incredibly difficult to identify them at the outset. Of the 1% of the fund managers, who manage to outperform the market consistently over large period of time, it is very difficult to identify them in advance. Based on studies, the odds of identifying a star manager in advance are comparable to winning a lottery. Fund management companies work hard using tactics like lobbying, advertising and support from financial media to keep the average investor in the dark, and so far has been quite successful at it. In terms of simple arithmetic, active investing is fundamentally a zero sum game (without fees and charges). Every trade involves two parties - a buyer and a seller. For every buyer (who believes that the price of the asset is going to up) there exist a seller (who believes that the price of the asset is going to go down). Since only one of them can be correct, it implies that for every winner there is a loser. It is no wonder then, the so many fund managers fail to outperform the market. When we add the fees charged by the fund management companies, it ends up becoming a negative sum game. Ultimately, it is the individual/retail investor who pays for it! Before the advent of the Internet, big institution had playing field tilted in their favor. It used to be that big institutions would receive information first, get to see the company first, meet the management and ask intelligent questions while the average investor would be kept in the dark. Institutions no longer enjoy such advantages. It is no surprise that it is has become near impossible for majority of the fund managers to outperform the market. So, what does all of this mean for the retail/average individuals? An average individual will be way better of with investing in a low cost index fund that tracks the entire market. Or in the words of legendary investor John Bogle, "What is the intellectual basis for indexing? Gross returns - cost = net returns. What is the intellectual basis for active management? I ve never heard one. The closest I have come is a manager says - I can do better. They all say I can do better, but probably only about 1% actually do better"
Investing in index funds will us help sleep better, enjoy life and can produce very satisfying results, if only we stay the course. 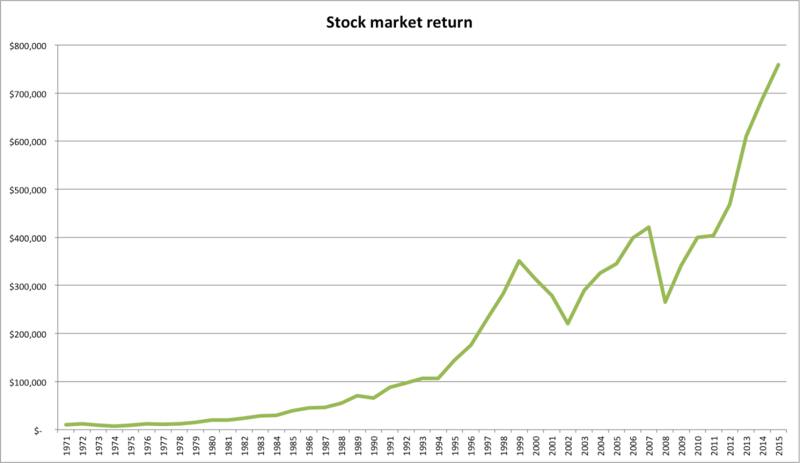 In the next article, I will focus on the rational (academic research) behind investing in index funds.